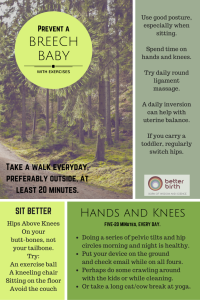 Need help with a breech baby? You have questions, but information about breech is notoriously difficult to come by. This book is like a private consultation, a knowledgeable friend, sitting down with you on your couch, walking you through your options. When do babies turn head down? Are breech babies normal and healthy? Here is the information you need to be truly informed. 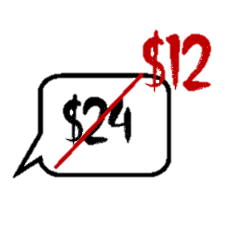 Try a Package with More Resources! For women who “would do anything” or want to “try everything,” this customizable program makes the book actionable. 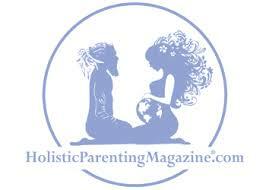 You will learn a healthy, 10 minute morning and evening routine to help you and your baby settle *down*. 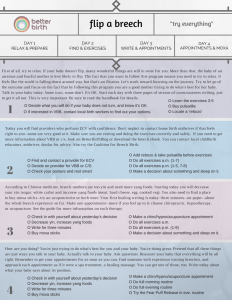 Helpful instructions, 16-day checklist, and Morning & Evening Routine posters. Try turning your baby at home with exercises in one day. 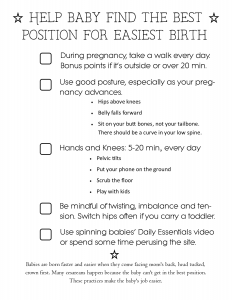 Try Everything Program to turn a breech baby, including a 16 day checklist, visualization poster, and more! 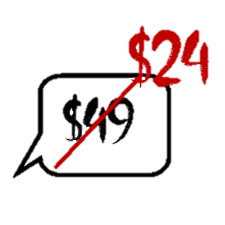 Tutorial for the Vinaver Method, which uses exercises to turn a baby head-down in as little as 24 hrs. LICENSE TO COPY supplemental materials. What can you do if you are 32 weeks with a breech baby? What can you do if you are 34 weeks with a breech baby? What can you do if you are 36 weeks with a breech baby? What can you do if you are 37 weeks with a breech baby? Get some direction for your particular situation. Why did you write this Handbook to put out there? 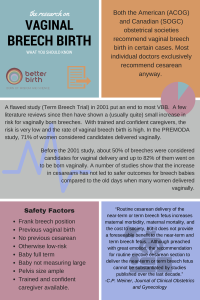 I’ve spent a lot of time learning about and researching breech babies….thinking about all the hows and whys and what ifs, checking out every new study. 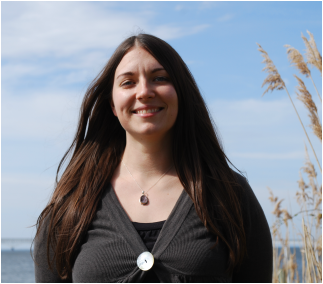 I put up a website to organize and share this information about four years ago (MyBreechBaby.org). Around 300 people visited the website every day. (Recently, MyBreechBaby got a big updating and moved here to Better Birth.) Women regularly contact me to help them determine their options. They are almost always feeling needy, lost, afraid, confused, overwhelmed. I wrote the Breech Baby Handbook to offer women and their partners a clear, comprehensive springboard to move forward with a breech baby. How is this different than your website? The website is a useful collection of breech information, available free for everyone. The Handbook is that information plus more, in an easy-to-read format. 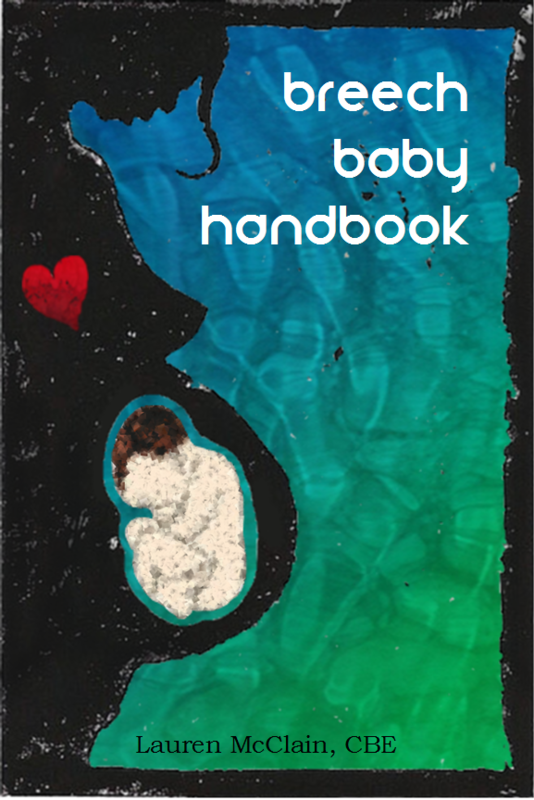 The Handbook contains everything I know about breech that may be helpful to you, is simply organized and easy to navigate. There are more charts and pictures, more details and it’s much easier to find what you need at a glance. The sections on research are more thorough and contain more links to studies. The Handbook will save you time. 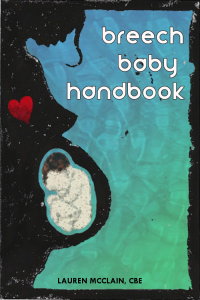 Breech Baby Handbook is like taking a crash course in breech birth and having a consultation for your situation. The website is like access to a pile of my notes. 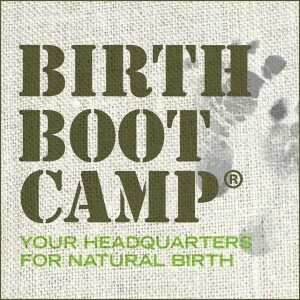 It sounds a lot like what is available free on Better Birth…is there overlap? The Handbook contains everything you will find on the website plus more, laid out in a way that helps you apply what you learn. 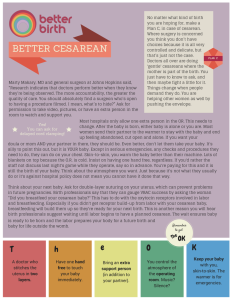 You can find much of the raw information in the breech section of Better Birth, but you will have to wade through it. The Handbook is more complete, it’s easy to navigate, printable, clear, and contains more research, links to studies, graphs, charts, and how-to information. Can I learn this for free elsewhere? Breech is a very niche topic. You are unlikely to find a book at your library–or even on Amazon–about breech. The exception is Breech Birth by Benna Waites, sometimes available on Amazon, which is excellent and worth a read if you have the time. 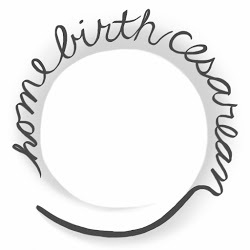 Some websites, such as Birth Without Fear blog, sometimes feature breech birth stories or carry posts about breech birth and options. But if you want to have it all at your fingertips and begin helping yourself or your client as soon as possible, Breech Baby Handbook will take you from confusion and stress to a clear path forward. Can you learn everything I did for free? Besides the price of a few conferences and a number of print books, I got all my information, science, and wisdom for free and so can you. The internet is huge. The availability of balanced information on breech is thin. This book is a distillation of what I’ve learned through all of it over almost 5 years. If you really want to know what there is to know about breech, you can save yourself a lot of time. Even if you only use the Handbook for the links to studies and as a platform for continued study. What is different about the package? The HANDBOOK PLUS! package comes with the book plus a number of other resources that make applying breech knowledge easier. 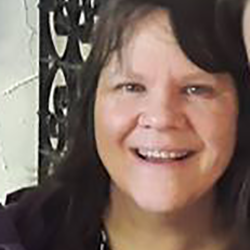 Many women with breech babies feel lost. If you are looking into breech because you want to turn your baby in order to avoid a cesarean, the package includes a step-by-step 16-day program called Try Everything to walk you through all the turning options that have helped people. The program includes a printable watercolor poster, more specific directions, a daily check-list, and a fear-release meditation. It also includes a few micro-courses, which are one-page printable graphics to learn about topics at a glance. Included are: Better Cesarean, Research on Vaginal Breech Birth, Preventing Breech Position. Is there really that much to say about breech babies? If you have a breech baby or want to help people who do, you know that these decisions are not easy to make. There is also a lot of discussion about breech babies–they are controversial. So if everyone were in agreement about what to do in the case of a breech baby you would not need a book to help you. But everyone is not in agreement, and this book helps you to see what people who have been working with and around breech babies have to say. Why should I trust you to provide this information? 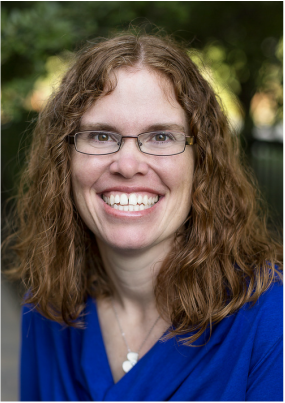 Besides having spent a lot of time researching, learning, and talking with professionals about breech babies, I am a childbirth educator and the mother of a breech baby. Most of all, I have a brain, I can read, and I’ve been using that to learn about breech babies because I want to help you. I want women with breech babies to feel more confident and calm. I want you to have access to the information you need to make an informed decision, and I want you to feel good about making it. The power should be in the hands of the people the decisions most affect. Your care provider, if she even has time to talk to you, probably doesn’t know all that much about breech. Information belongs in the hands of the consumers, so that’s where I am putting it. Of course. Breech is very controversial. I have heard it all, and I am presenting most of it to you. Some people don’t believe you should try to turn a baby through any means. I believe that babies will often turn head down if given the right environment, and I show you how to create that—at no risk to your baby. Some people believe breech birth is dangerous. Though the Breech Baby Handbook is very clear about the fact that cesareans are sometimes safest and there is no pressure to choose vaginal birth, I also want to bring back Vaginal Breech Birth so that those women who choose it can do so safely and easily. The Handbook dispels a lot of myths about vaginal breech birth and encourages women who feel good about it to pursue it. Yep. If the Handbook does not help you, let me know within 30 days and I’ll issue a refund. All I ask is that you let me know what was missing so I can make it more helpful for people.